Have you been thinking about buying a new home, but planning to wait til spring? 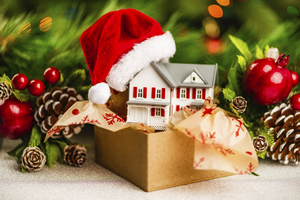 You might want to consider doing your home buying during the holidays... this can be a fantastic time of year for you to find that dream home and get a great deal! Who says the best presents come in small packages? How about a two story with a pool and a fireplace sized package? Let’s talk about a home shopping during the holidays. Let’s face it, no one really wants to put their house on the market during the holidays. Listing your home usually means the hassle of prepping the house for sale, and keeping it clean for showings, and scheduling open house events. Now try doing all that while putting up festive decorations, hosting special events, attending school programs, wrapping gifts, and still finding time for work and family. So a seller who has decided it is time to sell is probably finding that prospect a necessity, whether for a employment relocation, a family need, or any number of other reasons. This is where you, as the buyer, can have some purchasing power. Homes on the market during this time may be ripe for offers under the list price, due to the urgency of the seller to sell. Sellers may be more willing to take care of those inspection items because they need to get moving. And if you have the ability to move quickly, sellers may be very happy to oblige a short escrow period. (one caveat - check with your lender to check for any delays the holidays pose regarding time needed for closing the transaction).